Approximately 188,000 people in several impoverished towns underneath the Oroville Dam in northern California were suddenly forced to evacuate their homes Sunday afternoon amid fears that high water levels would overwhelm the structure and flood populated areas north of Sacramento. The water level appears to have subsided for the moment, but more rain is expected Wednesday that could once again put the dam at risk. The dam was at 151 percent capacity on Saturday, triggering the use of an emergency spillway for the first time in the dam’s 48-year history on Sunday. That same day, officials gave evacuation orders for the city of Oroville and towns in surrounding Yuba, Sutter and Butte counties, which remained in effect on Monday. If the deteriorating dam breaks, a 30-foot wall of water will descend upon the towns below. The dam is not functioning properly due to a massive hole 250 feet long and 45 feet deep in the dam’s main spillway. The risks of structural failure and of a breach at the Oroville dam have been well known for over a decade, with the government ignoring the issue and refusing to spend the relatively small amount that would be required to protect the lives of the hundreds of thousands at risk. In large part this is because the at-risk cities, including Marysville, Yuba City, Oroville, Live Oak and Wheatland, are home to mostly impoverished and working-class residents. While weather cannot be perfectly predicted or altered, the current threat to lives and homes is entirely man-made. The condition of the dam is representative of the deteriorating infrastructure in the United States. Little to no preparations were made to protect against this well-predicted threat of catastrophe. In 1997, residents living under the Oroville dam were also forced to evacuate when water levels came within a foot of overflowing the structure. Both the state and federal governments had been warned more than ten years ago that just such a situation involving the structural collapse of the emergency spillway could occur. On October 17, 2005, three environmental groups—the Friends of the River, the South Yuba Citizens League, and the Sierra Club—filed a motion with the Federal Energy Regulatory Commission (FERC) to have the emergency spillway covered in concrete. These organizations warned that the dam failed to meet modern safety standards and that large amounts of rain would overwhelm the primary spillway and that the emergency structure would erode. This is precisely what happened. Furthermore, the report stated: “A loss of crest control could not only cause additional damage to project lands and facilities but also cause damages and threaten lives in the protected floodplain downstream.” State and federal agencies ignored these concerns. FERC claimed that the emergency spillway could handle 350,000 cubic feet of water per second and that concerns were unfounded. However, on Sunday, water flowing at less than 5 percent that figure came close to realizing the environmental groups’ fears. Despite these warnings, nothing had been done during either Republican or Democratic administrations or by the Democratic-dominated legislature. The Oroville Dam was completed in 1968 and is the tallest in the United States. It sits on the Feather River, supplying water for much of the state. The state claims that the dam is still sound with the spillway inspected annually, last being repaired in 2013. The state ordered a last-minute evacuation that would have left hundreds dead if the dam had burst this weekend. The California Emergency Operations Center began issuing evacuation notices just four hours after giving a press conference in which the center said they expected no problems. 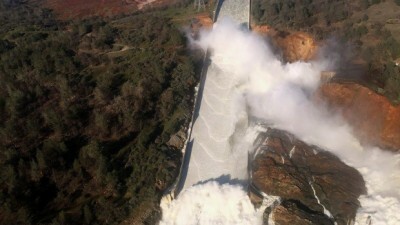 Suddenly, the DWR warned that the spillway could fail within an hour. California governor Jerry Brown subsequently issued a state emergency order. Residents began receiving alerts via robocalls or social media and had little time to prepare. The order to leave the area was given so suddenly that traffic along evacuation routes became congested, forcing some people to abandon their cars and walk to shelter. The potential for a catastrophe in northern California calls to mind the horrific events of Hurricane Katrina in 2005. Like then, the government has ignored well-founded warnings of danger caused by a lack of infrastructure spending and sprung a last-minute plan to evacuate the 188,000 people, many of whom would have drowned stuck in traffic had the dam actually burst. According to the American Society of Civil Engineers, 15,500 of the country’s 84,000 dams are “high-hazard” and death could result from dam failure. Remarkably, one third of high-hazard dams lack an emergency action plan to help protect residents from flood-related disaster. The average age of dams in the US is 52 years old, with 3 percent of dams built before 1900. Two thirds of dams are privately owned. The government placed security checks in place after September 11, 2001, which make it much more difficult for organizations to research dam safety and nearly impossible for residents living under dams to even find out the dam’s stability. There is no answer to be found within capitalism and the profit system to address the deteriorating social conditions and infrastructure that are too often highlighted by natural disasters. While the area around the Oroville Dam was spared destruction on Sunday, nothing will be done to prevent a similar situation from developing in the immediate or long-distance future.